The Dynamic V8 uses active polarization technology to provide a true air cleaning solution. The V8 is rated as a MERV 15+ filter that also has the ability to remove volatile organic compounds (VOC) from the air stream without ionizing or ozone generation. The V8 has extremely low pressure drops typically 0.2" W.G. of clean pressure drop with a typical change out static pressure of 0.6" W.G. The fan energy savings potential with this lower pressure drop solution, makes this technology ideal to be retrofit into existing air handling equipment. The Dynamic V8 filter can hold approximately nine times the mass of traditional comparable filters due to the way that the debris loads arounds the 360 degrees of the fibers. This large surface area enables the V8 to remain in operation for many years before the media needs to be replaced. 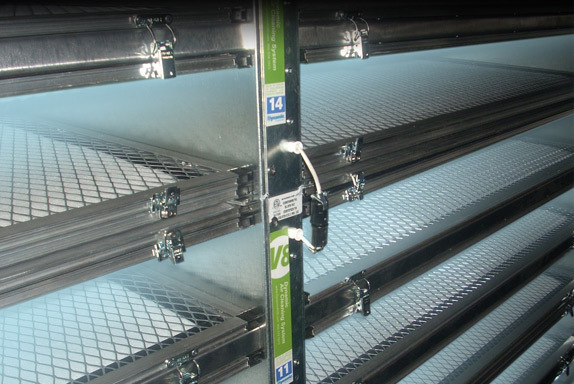 This product not only uses less fan energy then comparable filters, there is significantly less time required to maintain the air handling system due to the long life of the filter media. Retrofit energy incentive rebates can be achieved when improving existing air handling systems. Removing ultrafine particles, odors, VOCs, biologicals and gas phase contaminants from indoor air and ventilation air. Up to 2/3 less energy, through less fan horsepower, and where appropriate, helping to reduce outdoor air levels. Through longer service intervals, eliminating pre-filters and post-filters, and simplifying handling and disposal.